The fishing trawler Horizon started sinking after water ingress on 20 nautical miles off Seven Heads in West Cork, Ireland. The bad weather and strong winds, caused the problems for the ship, which started sinking. The crew sent distress signal to the local authorities and requested immediate assistance. 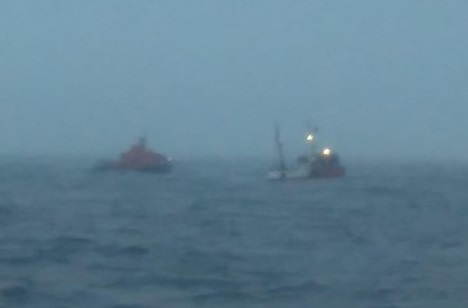 At the scene of the accident was sent coast guard lifeboat, which dispatched to the fishing trawler mobile pump and crew for salvage. The fishing vessel Horizon was stabilized and the water ingress was put under control. The lifeboat started towing of the troubled ship with slow speed to the small fishing village of Union Hall, where will be berthed at the pier for further repairs. The ship was stabilized and will be inspected before return in operations. During the accident the weather conditions at sea were very poor with strong winds force 6/7 with heavy swells in the area. The visibility was very poor with low lying fog. Fortunately there were no injured people and water pollution. The local authorities and coast guard started investigation for the root cause of water ingress. The fishing trawler Horizon has overall length of 17.00 m, moulded beam of 5.00 m and maximum draft of 2.00 m.